Please have a look through the Frequently asked Taxidermy Questions below, I you do not find the answer please contact Mike Gadd Taxidermist. 1. How much does it cost to have my item? Please see my very comprehensive Taxidermy Price List. There may be an extra charge if you are interested in an item from my frozen taxidermy stock. Please note that when choosing a taxidermist, taxidermists do a complex job and this can vary dramatically from one taxidermist to another. Do not automatically choose the cheapest quote and you should choose based on the taxidermist's work, what you like and what you can afford. 2. How do I send an item to you? Please look at the information on the Price List page which details the relevant information to the appropriate species ie Birds, Mammals, Fish, Game Heads. 3. How much is my item worth? I am unable to give free valuations as I am self-employed and cannot take excessive time on such enquiries unless there is some form of payment to cover my time. Please do not think me rude but I getting many emails on this subject and I would need to spend hours each day earning nothing just to answer such emails. Taxidermy items are like any form of art ie. it is down to who did it and how well it is done. An average item can be from 50p to over £1,000. Have a look around the web and look for a similar item in species and quality as a guide. One other thing to bear in mind is that you may need an Article 10 licence to sell the item and you should check with DEFRA, now Animal Health. 4. Where can I sell my Taxidermy item? I am only interested in better quality or named cased items. Please provide as much information as you can about each item with photographs. If you wish to sell your item yourself, you can try local auctions or ebay but please remember that many items require appropriate licences. Ebay is monitored by the authorities and any items offered for sale without the appropriate licences will be deleted from their site, your details may be given to the authorities and you may be prosecuted. 5. Do I need a licence to sell Taxidermy? I am unable to give a quick free advice on this due to the complexity and possible legal implications. Licensing depends on the item and you should get in contact with the Department for Environment, Food and Rural Affairs (DEFRA), now known as Animal Health, at Rm 8/22 Tollgate House Bristol BS2 9DJ. They are the governing body for taxidermy in the UK. 6. Who is my local Taxidermist? I get quite a few enquiries asking for a " local" taxidermist. I do not have a database of taxidermists although I know a few. Taxidermists are artists - there are good artists and there are bad artists. In the UK, taxidermists can obtain qualifications for this art through the Guild of Taxidermists which is the only recognised body representing taxidermists in the UK. There are more than 2,000 taxidermists in the UK of which only 49 (as of 2006) have some form of qualification - 16 of these are bird specialist taxidermists and 6 are mammal specialist taxidermists. I am a Master in Bird and Specialist in Birds, Mammals, Game Head. I also have have advanced qualifications in Birds and Mammals. Like purchasing an oil painting, you would go to an artist whose work you liked and you can afford. Items can also be sent around the country and abroad. If you are just looking for a taxidermist near to you and quality is not important, try your local Yellow Pages. 7. How do I cure/soften a skin? This is not "dip in magic ingredient A". It is a complex area and not for the faint hearted. Do a web search for tanning/ tanning kits which may get you in the right direction. in the meantime, keep the skin in a freezer. If the item is already tanned, it may not be possible to do much with it but you may be able to re-oil and stake which again is complex and really for a skilled person. 8. How do I become a Taxidermist? 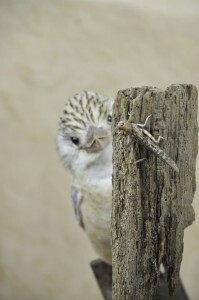 A great starting point is one of the courses I offer - Beginner Taxidermy Training Courses in birds or mammals. If none of my courses are appropriate for you, you should expect as a minimum a three day course with a qualified taxidermist specialising in the field of taxidermy that you are interested in. A taxidermist's qualification can be checked via the Guild of Taxidermists website - www.taxidermy.org.uk. I would then suggest becoming a member of the Guild of Taxidermists where you will meet fellow taxidermists and be able to attend lectures on taxidermy although the more complex demonstrations of some advanced areas of taxidermy provided by the Guild will make more a lot more sense after having attended one of my or another good course. At the moment, I have a training book on Beginner Taxidermy Small Mammal. I am working on a bird taxidermy training book. 9. I need some glass eyes / taxidermy / supply materials. I use Watkins & Doncaster www.watdon.co.uk, John Hallett http://stores.ebay.co.uk/jhtsupplies or Snowdonia www.snowdoniasupplies.co.uk. There are also many American and European supply companies if you are serious about order size or complexity. Try a search on the web. 10. How do I keep a dead item? You can keep any item in a freezer. This will be fine and will keep for several years well wrapped in polythene. Put it in a box if it is small/fragile to protect it. Remember to record How, Where and When it died. This information is needed by taxidermists to comply with taxidermy law in the UK. If an item is too large, it would need to be skinned by a taxidermist before it is frozen. I no longer do Pet Taxidermy. In short but “Get it done right or not at all”. Your pet can be kept deep frozen for many years, so there is no rush! Taxidermy will not bring your lost animal back to life. It will at best be a reasonable representation of your pet. Taxidermy is an art If you decide to go ahead with modeling your animal, please choose a taxidermist by the quality of their work, not their price or location. If they are too expensive or you do not like their location, DO NOT HAVE THE ITEM DONE. You should expect to pay approximately twice the cost of a wild species, as there will be a lot more work in the project. When choosing a taxidermist, please note that there are, as of 2000, about 3,000 taxidermists in the UK of which there are 14 Bird Specialists, 6 Mammal Specialists and 4 Fish Specialists. A taxidermist with this qualification has the MINIMUM standard that you should accept. They must be able to show you work of a good standard. Make sure the person you speak to is going to do the work and if not, make sure you are happy with the person they are sending it to. Some dealers just send the item to the cheapest trade person they can find. I get a considerable number of journalists wishing to talk to me or customers of mine about pet taxidermy. I actually get more enquiries from journalists regarding pets than I do from pet owners! Most taxidermists in the UK mainly do wild UK animals and the usual cause of death of these are killed by the general public eg road traffic accidents, flying into windows, power lines, pollution, cats etc. Please only contact me if you appreciate the fact that pet taxidermy is a minuscule part of the trade. 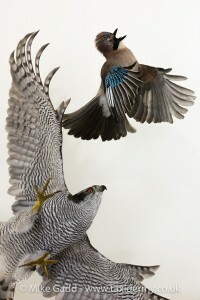 You can also find more information on the art of taxidermy at the Guild of Taxidermists' website. Repair: If the item is not very valuable, this can be done by your local taxidermist (have a look in your local Yellow Pages). Insect attack: I believe current museum policy is to freeze the item below 22C or lower for approximately 2 weeks, remove the item from the freezer and keep it in a sealed bag for a week, then re-freeze for a further week. This ensures that any eggs that hatch due to a mock spring are killed. Cleaning: This can be done by gently knocking off dust or using a blower on mammals. A damp cloth can also be used to clean more stubborn stains. You will need to take the item to a taxidermist if this fails or you feel it is beyond this stage. 14. Can I import an item to my country? All my taxidermy complies with UK and European laws, so they can be imported into any European country. The main website is www.fws.gov.